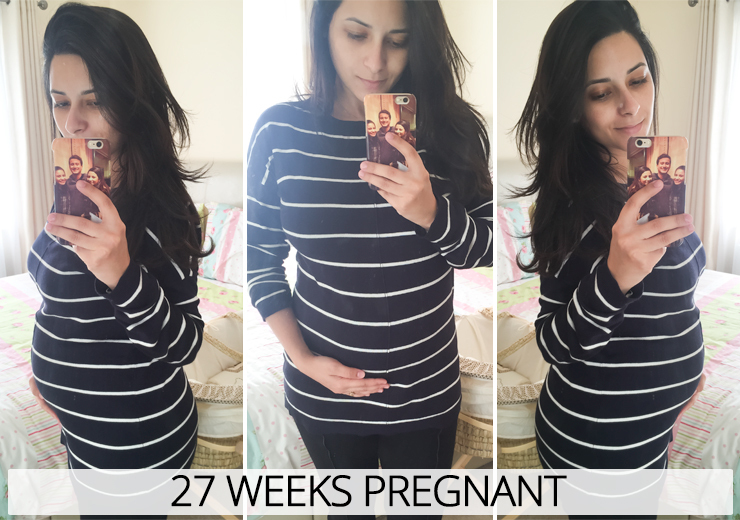 I’m sorry for missing my 26 Week Pregnancy Diary – I just didn’t feel like I had enough new symptoms and things to talk about on a blog post or a video. 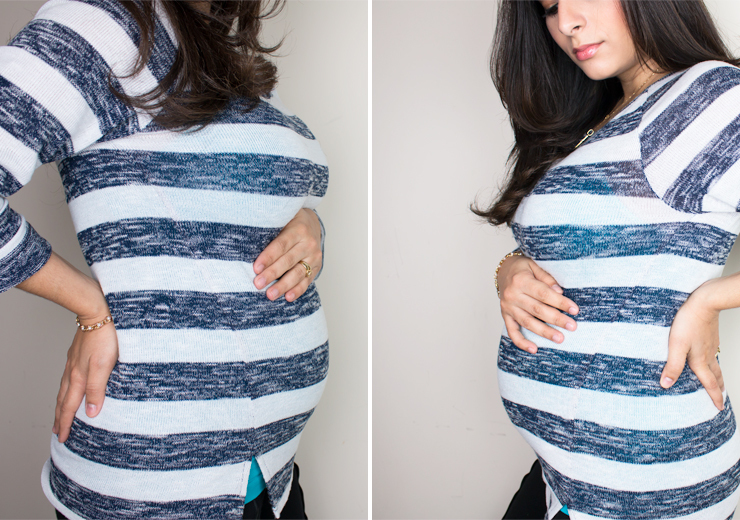 Instead, I’m doing a two-in-one and updating you on my 26 & 27 Weeks at the same time. I filmed a video talking about my main symptoms for weeks 26 & 27 of my pregnancy, as I know some people prefer to get all the information in 10 minutes. Others (like me) prefer reading more in-depth about it, so there’s a bit of both this week. I had just filmed a makeup tutorial, hence the intense smokey eye going on, so if you liked the makeup I’m wearing on this video, keep your eyes peeled for that tutorial, which is coming very soon. Click the play button to watch my Pregnancy Vlog, or if you can’t see the video above, click here to watch it on YouTube. Total weight gain: About 14lbs/ 1st/ 6.7kg. My weight gain was the most noticeable thing for me during Week 26; every time I got up on the scales, the pounds were going up, and up, and up. I did get a bit worried, but I wasn’t eating anything different from previous weeks, so I just kept on getting my 5-a-day and hoped for the best. Thankfully, on Week 27 I maintained the same total weight gain, which was kind of a relief, so he must have grown a lot the previous week for my weight to go up so rapidly. Maternity clothes? I ordered a Maternity Bra from Asos, which fits so comfortably and nicely – just what I needed. I also got some comfy pyjama bottoms, and a cute Maternity Floral Dress on sale, and hopefully that will still fit me for 13 more weeks. Sleep: Getting considerably worse. I’m struggling to fall asleep because, for some reason, my mind is so active every night, so it takes me a couple of hours after lights-out to actually drift away. As well, my hips and back have been so painful these past 2 weeks – I definitely need to get myself a pregnancy pillow ASAP! Best moment this week: On Week 26, the best moment was my birthday! Even though getting older is not as much fun as it used to be, I had a lovely day and generally felt really happy and loved! :) For Week 27, I enjoyed doing some online shopping on Amazon, and getting lots of baby stuff I had been meaning to get for a while. Let me know if you’d like to see a haul of the things I bought. Miss anything? Not really; just being nimble and being able to sleep easily. I also really fancied a glass of wine this week! Movement: Still plenty of movement, though on Week 26 he was kicking lower down and on Week 27 he seems to have found my ribs – ouch! I swear sometimes I feel movement really far up and really far down at the same time; I can’t believe he is that big already! Food cravings: I’ve been eating a lot of carrots and prunes recently; can’t seem to get enough of them! And it also helps that the prunes are great for constipation and carrots don’t aggravate my acid reflux & heartburn. Anything making you queasy or sick: I haven’t been sick in 4 weeks – hooray! But I still can’t stand the idea of fried food and anything with a fatty smell. Labour signs: No, but I did start to experience some Braxton Hicks contractions, which was new to me. Symptoms: Much less nausea, but tons of acid reflux and heartburn. I’ve also had a bit of bladder incontinence during Week 26 – it honestly made me feel like an elderly lady! My face has been breaking out in spots, which is totally uncommon for me, and I’ve had some constipation over the last 2 weeks. All the fun symptoms – #not. Belly button in or out? Almost out – any day now it will pop! Wedding rings on or off? Off! Looking forward to: My midwife appointment next Wednesday and finally buying the pushchair & car seat! 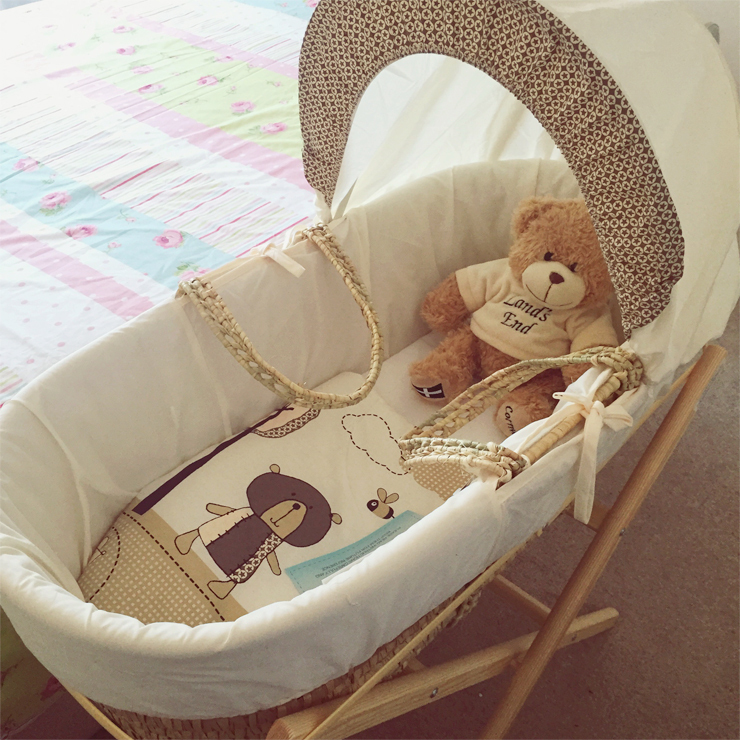 As you can see on the photo above, our Moses basket stand from Amazon arrived and I couldn’t wait to set it up in our bedroom – so cute! Golden Globes 2013: Red Carpet Favourites! I really like the questions and answers you write along with the pregnancy vlog updates! It’ll be fun for you to look back on all this I think. 3 more months to go, yay!